Dating from the 1870s, Knock Castle has what can only be described as a chequered history. Until recently it was a health spa, which had been owned and operated by the Seventh Day Adventist Church for over 50 years. In 2007 the castle was snapped up by the Henderson family, to be relaunched as a mid-market hotel with Jason Henderson installed as both Head Chef and General Manager. There has been a substantial investment in the property since, with major works such as the refit of the large, heated swimming pool (set in a vast conservatory with spectacular views to the hills and mountains) as well as new carpetting throughout. There is a rolling programme to upgrade rooms and bathrooms. The treatment rooms of the spa offer a full range of pampering and pummeling using Dermalogica products, there are saunas, steam-rooms, a well-eqipped gym and, thankfully, a cosy whisky bar and dinky 12- seater cinema for the less actively inclined. Knock Castle is a work in progress. My room was spacious and spotless, with an enormous super-king bed and a newly fitted bathroom in slate and stone, built around an elevated bath set into a turret. Decor was a touch mix and match with some antique pieces married to a slightly odd choice of ethnic pottery and rather unfortunate artificial flowers. But then the Hendersons would appear not to be going for the absolute super-luxury end of the country house market: current pre-season mid-week rates start at just £139 for two people including bed & breakfast, table d’hote dinner and access to the spa facilities. 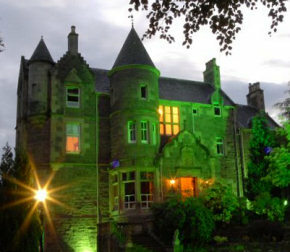 The house has the granduer and the setting for those who want to dress up in their finest and play lord of the manor (they will arrange golf, fishing and shooting on nearby estates), but the most recent major upgrade to the hotel shows how the Hendersons want Knock to appeal to a younger, less formal clientele too. The new rooftop restaurant, ‘Stag’s View’, has panoramic views of the Strathearn Valley from every table and serves table d’hote meals and a small range of bar menu-type food, with a chic outdoor terrace for summer months. 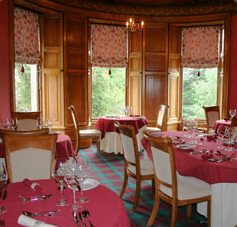 This is also the venue for residents to enjoy a substantial Scottish breakfast. But I dined in the more formal Oak Restaurant, in one of the castle’s most beautiful rooms with carved wooden ceilings and stained glass panelling. A word for the hotel’s staff led by the engaging Jason Henderson and warm and friendly assistant manager Yvonne. Nothing was too much trouble, and as with all intimate hotels of this size, that is what makes the difference between and good experience and a bad one. ebourg 1967 (£940) or Château Marquis de Terme Margaux from 1966 (£147) amongst its more esoteric offerings. The a la carte menu has three or four choices at each course, and three courses would run to around £35. We chose the tasting menu, starting with a little velouté of asparagus and truffle. It was thick and sweet, though underpinned by an earthy flavour, the asparagus subtle and the truffle adding depth. Next up came confit scallops set on herb blinis with a celeriac remoulade and apple vanilla compote. In truth, this dish wasn’t entirely successful. The scallops, had been given an inventive slow-cooked confit treatment before being flash fried for serving. To me they were served too cold, and that perhaps contributed to them being rather dry, waxy and dense in texture. On the other hand, the remouldade was tangy without being vinegary and the vanilla-infused compote was delightfully sweet yet sharp. An accompanying glass of ripe 2007 Sancerre from Domaine de la Chézatte worked well. Next, a crunchy green apple sorbet freshened the palate before the main course – fillet of beef – served with 1982 Tondonia Rioja which was a special treat with its super-ripe, rich, heady aromas and flavours. The beef was a fairly heroic fillet, cooked as requested and topped with parsnip crisps. Really nicely cooked fondant potatoes came scented with rosemary, whilst creamy pasnip purée and sweet red cabbage picked up the wine deliciously. Crème Brûllée for dessert was silky and satisfying, though the caramelised fig flavour did not come through strongly enough, but the little pink peppercorn shortbreads that accompanied it were buttery, short and delicious. Finally, Scottish and French cheeses were in good condition, served with coarse and crumbly homemade oatcakes and plum chutney. As I sipped coffee with homemade chocolates I considered this meal to have been really rather good overall. It had a few flaws in conception or execution, but as honest food made from good local ingredients and cooked with a bit of passion, it sent us upstairs to that giant and comfortable super-king bed in a contented frame of mind. Knock Castle does not compete on either grandeur, luxury or Michelin-starred cuisine with neighbours like Gleneagles or Kinnaird, but then I really don’t think it is trying to. For a comfortable break with plenty to do indoors and out, an easy commute from Glasgow or Edinburgh and warm hospitality, it is doing what it does very nicely.